The Independence Day was celebrated by the management and employees of Cognus with great patriotic passion and enthusiasm on August 15, 2014. Every person participated intensely in all the games and events that had been prearranged by the HR department. The whole office was decorated with lots of tricolored balloons & flags which aroused the patriotic feeling in all of us. 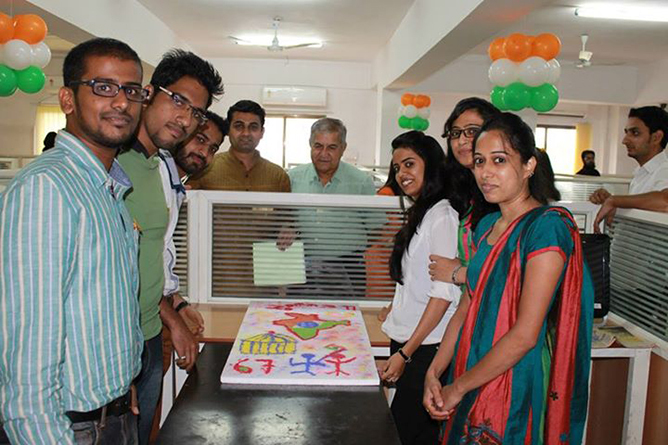 Few glances of Independence Day celebration in our office. Inter-departmental competitions were planned for the day, which turned up as a battle of nerves & skills between the teams. Here is a quick look at the beautiful & decorative pieces of art created by the Cognusians themed on obviously – country’s Independence & freedom fighters! It was a great feeling to see everyone completely charged and in full swing. Thanks to all the colleagues for making this a yet another memorable event! Cognusians are now looking forward to Diwali... the count down for fun has already begun. Stay tuned to celebrate Diwali with us.